Dr Chloe Houston and I would like to thank the 95 students who completed our ‘Diversifying Assessments’ Survey Monkey poll. We appreciate very much the time you took to answer the questions and the detail you provided. This is going to help us a great deal in reflecting on our assessment and feedback practices. A total 95 DEL students took part in the survey. 85% said they valued the opportunity to be assessed with diverse methods. 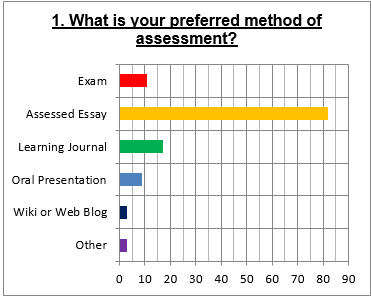 The Assessed Essay was by far the most popular method of assessment, followed by the learning journal. 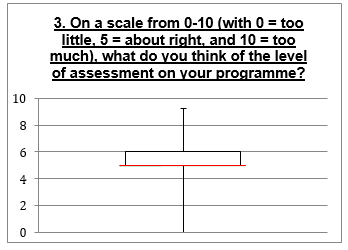 However, only a small proportion of students have been assessed with a learning journal so it is likely that a very high percentage have stated it to be their preferred method of assessment. Students gave an average score of 5.1 for the level of assessment on their programmes, with 5 being both the mode and the median scores. 34% found the level of detail covered most useful in feedback, 24% the feedback on writing style, 16% the clarity of the feedback, and 12% its promptness. 7% valued alternative characteristics (eg. ‘sensitivity’) and 7% did not respond to this question. 66% said they always submit formative essays, 18% regularly, 8% half of the time, 4% sometimes, and 4% never do. 40% said they always attend essay supervisions for their formative essays, 14% regularly, 10% half of the time, 22% sometimes, and 14% never do. 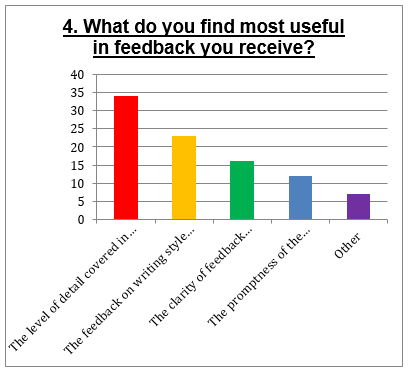 The constructive responses to the ‘feedback’ questions were particularly useful and we will be taking comments forward to the next academic session. At our recent Exams Board, our external examiners praised the detail and the quality of our feedback and noted that it is an example of sector good practice. They added that they hope our students read the detailed feedback we provide! While there are always improvements that can be made to any system, the externals’ comments usefully remind us that DEL surpasses many other UK HE Literature Departments in its feedback quality. We will continue to reflect on our feedback practices and continue to enhance its usefulness to our students so that it works effectively to augment attainment. We will be holding a second student focus group meeting next term (this is a year long project), again in my room, and again with up to 12 students drawn from each year group responding to our questions and assessment ideas. We have funding for this project and we are able to offer a £10 Amazon voucher (and plenty of doughnuts) for every group contributor to say thank you for taking part. Six students have already indicated that they would like to be a member of the next focus group – please look out for emails and posters early next term asking for another 5 or 6 volunteers (or just email me or Chloe). We want to include you as we review our assessment and feedback systems so that we can respond to your input. Thank you once again for all your help so far.